For the last several years, I haven’t posted rewards or consequences in my classroom. To be honest, I never even really gave them much thought. However, after attending the NJPAECET2 conference several years ago, my attitude changed. Two speakers, Baruti Kafele and Gemar Mills, principals who faced some of the most challenging students imaginable, opened my eyes to the importance of having clearly stated and prominently displayed Rewards and Consequences in my classroom. Although neither of them specifically discussed the idea of Rewards and Consequences, both of them hammered home the idea that classroom climate and culture are of the utmost importance in determining student success. Both leaders told fascinating and inspiring stories which made me realize that giving my students clear rewards and clear consequences can clearly send the message that I AM SERIOUS about YOU doing YOUR work. 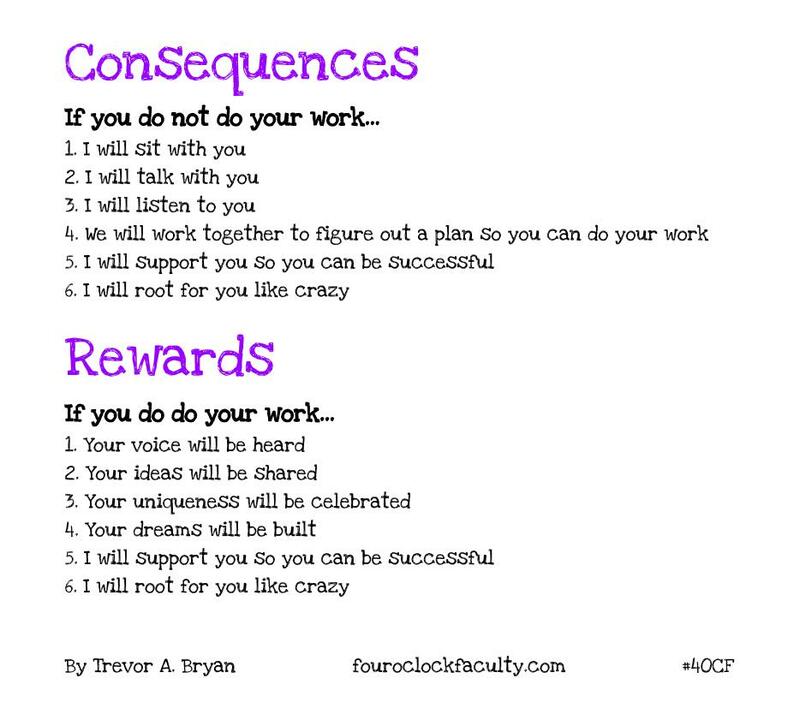 As we begin the new school year, maybe we can reflect on an updated version of rewards and consequences.